Solanum genus, some members of which I’ll be writing about today, is in the Solanaceae or the Nightshade Family. The Nightshade Family is very diverse with a wide range of annuals and perennials of various sizes. 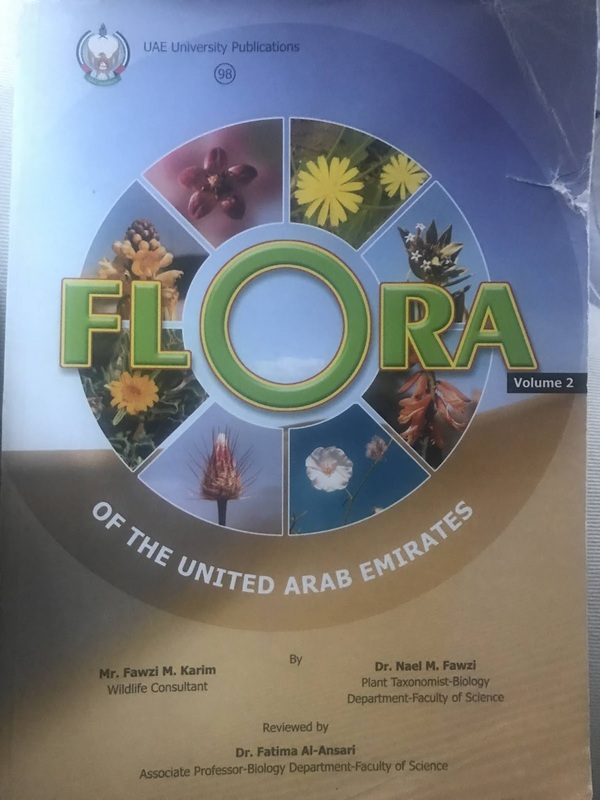 According to the “Flora of United Arab Emirates” book by UAE University (picture in the end of this post) the Nightshade Family is represented by 6 genuses (or “genera” to be academically correct) in the UAE. These genesus are further represented by 9 species, excluding the cultivated ones. Everyone, well at least those who have gardened long enough, knows that most of the species in the family are poisonous. Some are even deadly. Now, there are some familiar species that are perfectly fine to eat such as tomatoes, potatoes, eggplants and peppers. 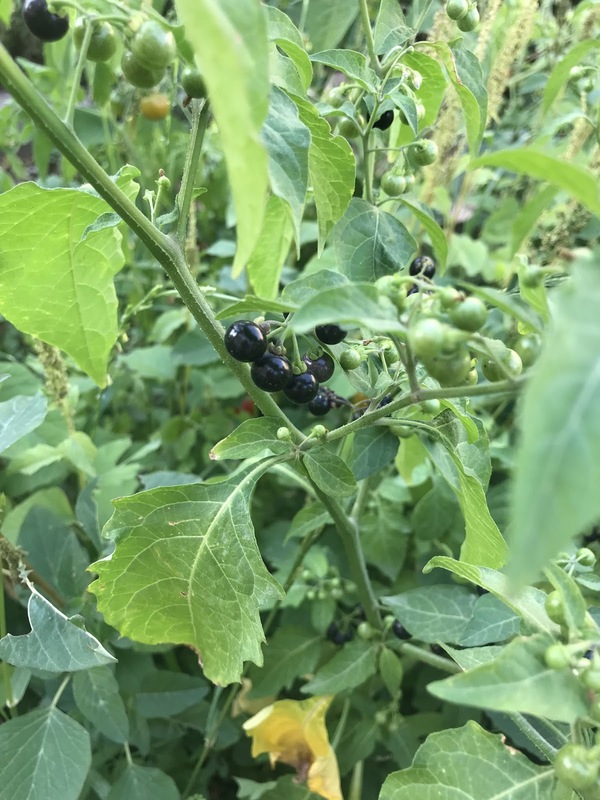 There’s is one interesting species of solanum that is edible, yet is easily confused with the non edible and poisonous ones. 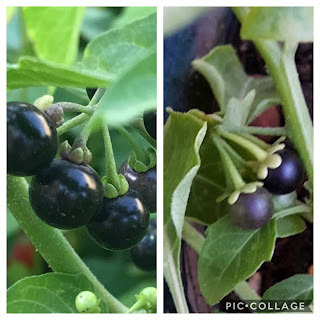 It’s is the Solanum Nigrum or Black Nightshade. 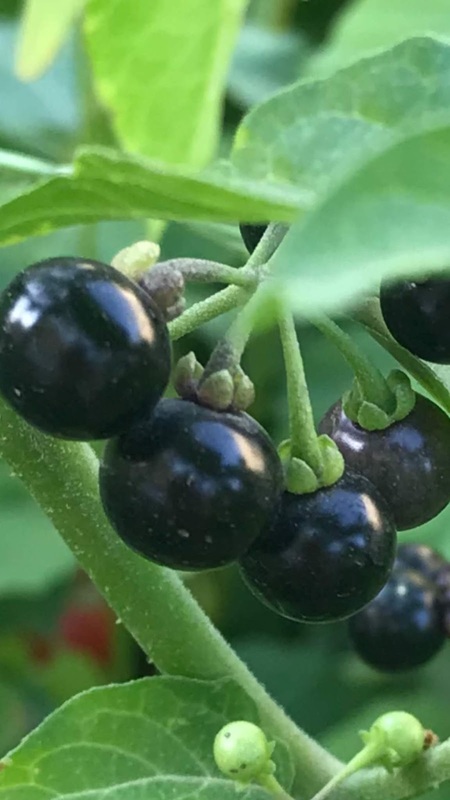 It’s berries start green, when they’re highly poisonous, and turn to attractive black little things that resemble blueberries. The black ripe berries are edible and are often eaten by kids in some places, and is apparently even made into jams and preserves. It grew in my garden a few seasons ago and it was then that I was introduced to it. You can read about it here. The only issue with the book is that it doesn’t include colored pictures for all the species, so matching the species sent me back to the Internet. Considering that that other three species, Solanum Incanum, Solanum Luteum, and Solanum Surattense, all have yellow fruits when ripe, I came to a conclusion that the unidentifed fruit in my garden is either the most probably poisonous Solanum Americanum, or some other unidentified solanum that I wouldn’t want to consume. 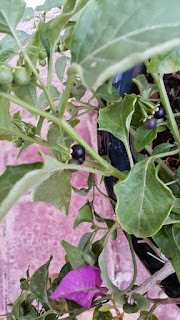 I am not even sure now if the solanum that voluntarily grew in my garden a few seasons ago was the edible Solanum Negrum, even though I did try it back then. I do not claim that the species mentioned here are what I suppose them to be, so please use your own judgment and do not consume anything you are not 100% sure is edible. Please share your thoughts in the comments and correct me if I’m wrong. As promised, this year I want to post DIY’s and low cost/budget gardening ideas. 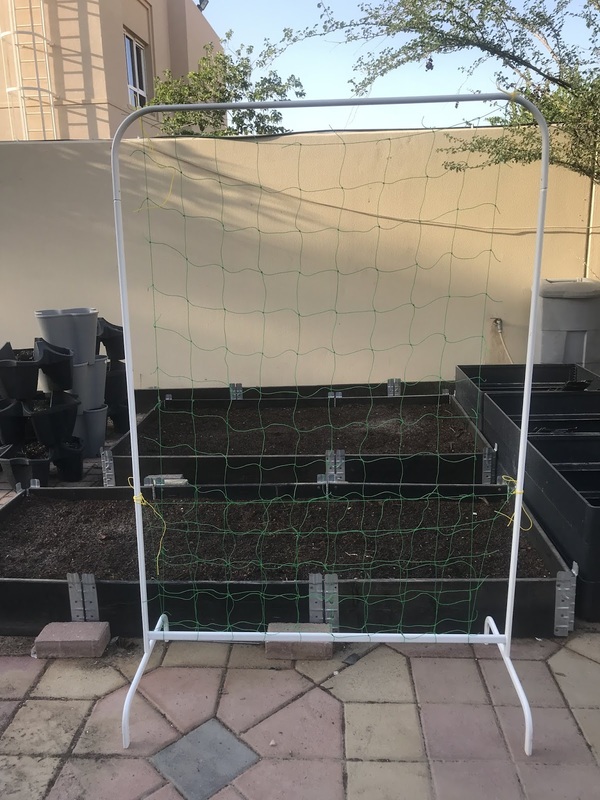 I’ll start with this DIY trellis system that is affordable, easy to put together, easy to put away, and doesn’t require you to drill holes (easpically good for those living in rentals). What is a trellis? It’s a structure that supports vining plants and is great way to garden vertically. This is especially useful for people with small gardens, those who garden on a balcony, and anyone who wants to make the best use of their space. Plants that will grow up the trellis are plenty. Tomatoes (indeterminate ones, more on this in this post indeterminate vs determinate), beans (the runner/climbing/pole ones), peas (agin the climbing ones), gourds, flowers like nasturtiums (did you know they’re edible too? 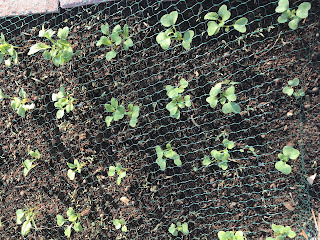 ), cucumbers, Malabar spinach, some squashes and others. Trellises come in many shapes and sizes, and are made of different materials. Sadly, specialty trellises can be expensive, while gardening doesn’t have to. I believe everyone should be able to garden and I also believe gardening should be affordable. Plus, I love DIY’s and this is another hobby of mine. The trellis I’m showing you today is not my idea per se. I saw a similar set up in one of my books (though that one was unstable) and it hit me. I was like: why didn’t I think of this before. I had the perfect “trellis to be” right there in my home. And it’s a cheap one but good quality one. The trellis to be is nothing but an inexpensive clothes rack from Ikea. Yes, a clothes rack. 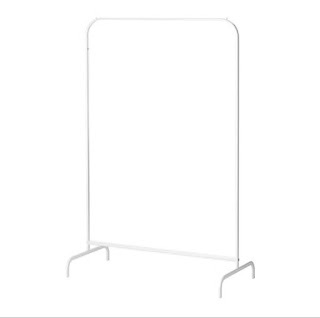 It’s a Mulig clothes rack for 29 aed. 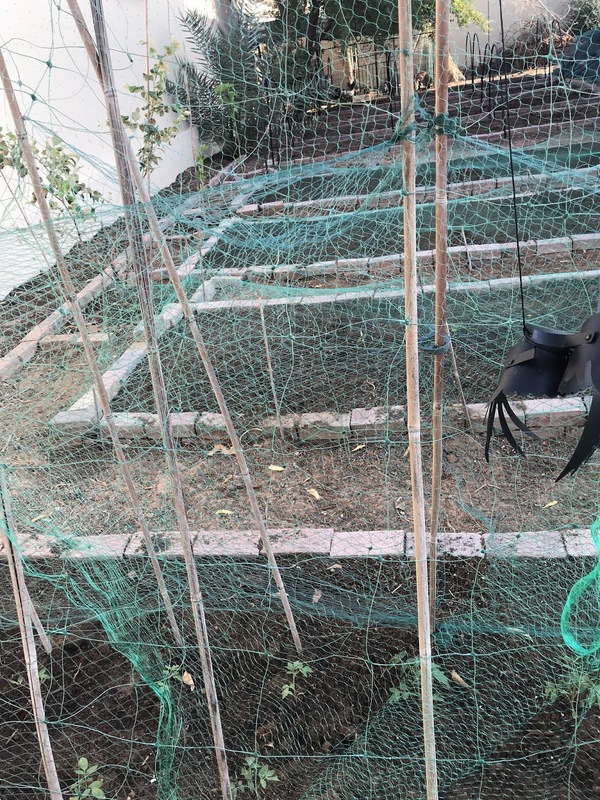 To make this trellis you’ll need Mulig clothes rack from Ikea, a gardening net (I happen to have a couple from Daiso) or a twine or strong rope of some sorts. Assemble the clothes rack as directed and attach the gardening net. 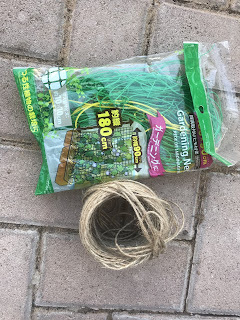 If you don’t have one then use strong twine or a rope and use that instead. 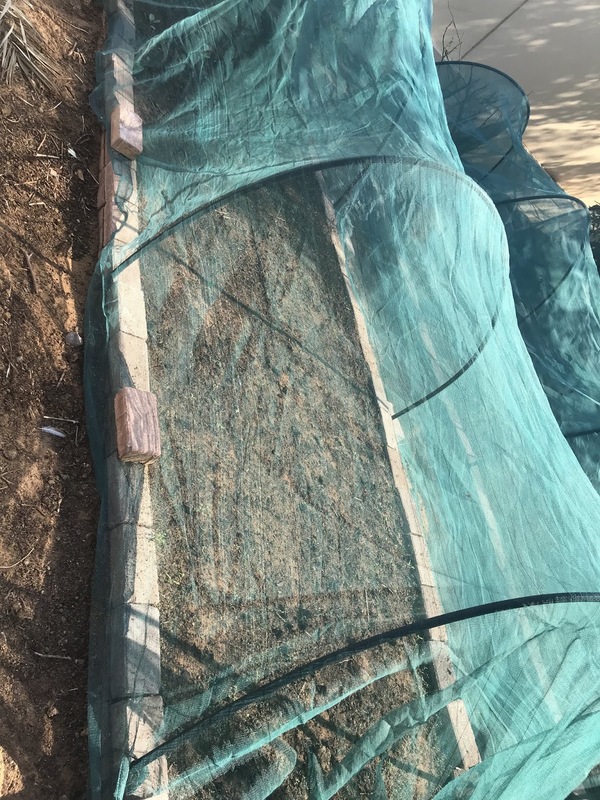 You can wrap the twine vertically and then horizontally, creating a net (I’ll post a tutorial if I have the time InshaAllah). That’s it, you made a trellis. Your new trellis is 99cm wide and 151cm high. Please not that the maximum weight this particular trellis will bear is 20kg. If you use another rack the maximum load may be different. Plan what you will grow up the trellis accorsingly. For example, some squashes can weigh a lot, so don’t grow too many up one trellis. 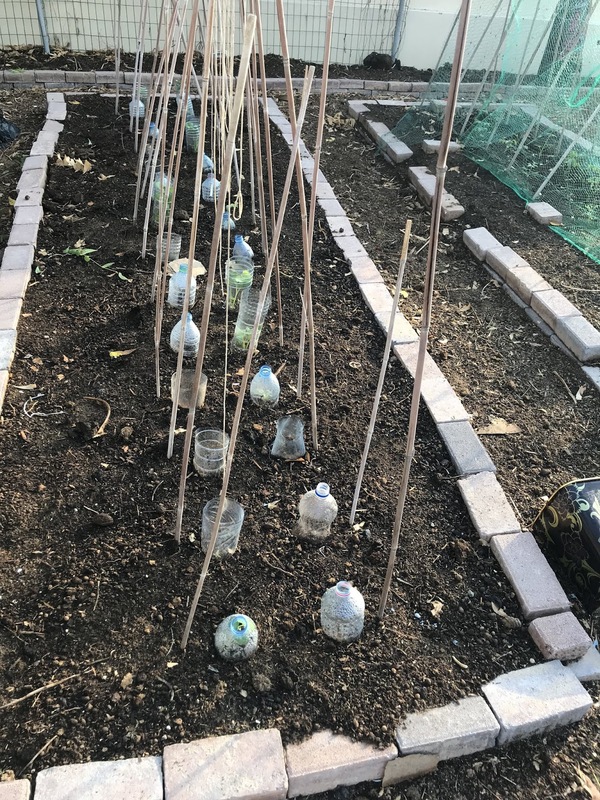 Another tip is to put this trellis against the wall or push it into the soil, so that it doesn’t tip/blow over with the wind. I hope you like today’s post. If you did, please comment below. If you have other ideas please share. This may be a little late but still useful as there’s still time to sow seeds. 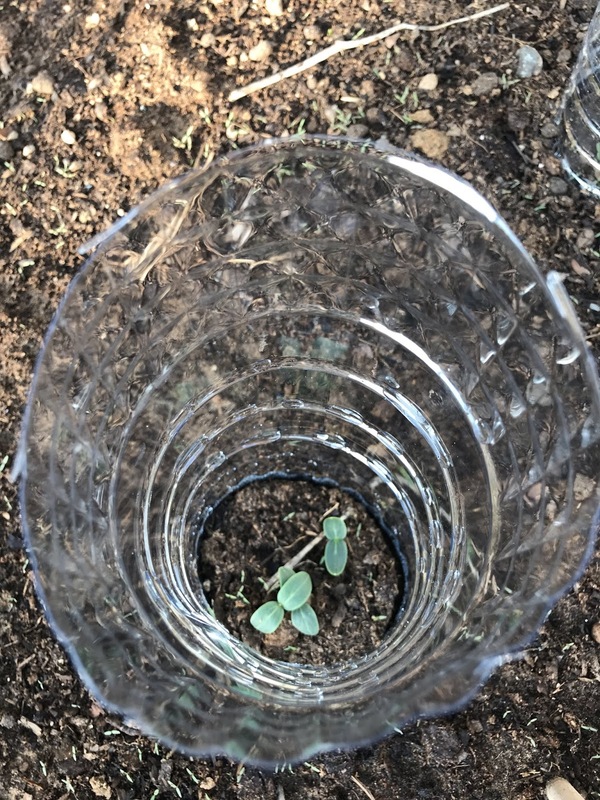 Every year I encounter a big problem when I sow seeds: the birds eat my seedlings. It’s annoying as planting seeds is the hardest part of gardening, it takes the longest time. The only way that works for me is the physical barrier of some sorts. I tried sticking sticks into the ground around the seedlings before but the bigger birds would push these away. This year I’m using three types of protection: the shading net, the bird netting, and bottles. Yes, plastic bottles. How do you protect your garden from birds? It’s finally the season. Finally, we can work comfortably in our gardens. Finally, we can see the signs of green life. Finally we can plain enjoy the outdoors. I love October. First of all I can spend more time in the garden. And second of all, I was born in October. And though I hated it as a child (cuz in Russia the weather would start getting cold, and it would get dark and dusty and dirty cuz of the rain), I love it now. October is when we plant most of our plants in this part of the world, or actually anywhere in the Northern Hemisphere where the summers are too hot to plant most things. It is the busiest time in a gardener’ year. We are busy with buying plants, starting seeds, amending and preparing our soils, decorating our Zens and so on. I think the plant shops love this time of the year as much as we do 😃. It’s like a long green Friday.. This is the time of the year where our gardens come alive again, after the harsh, hot summer. And there’s so much to do. In fact it’s so much that it can get overwhelming at times, for both new and experienced gardeners alike. 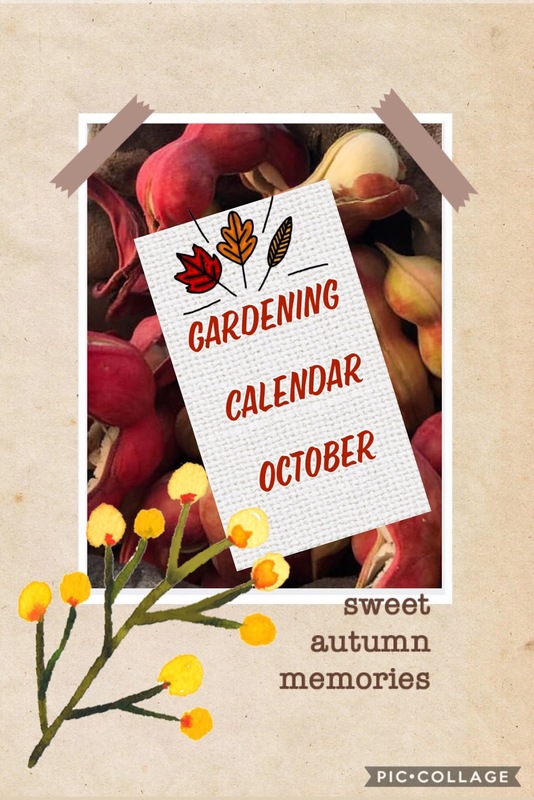 That’s why our little gardening calendar for the month of October was created. To help you stay on track, at least a little. I apologize for writing this late. I wasn’t feeling well the past week and am a bit behind myself. But the beauty of gardening here is that our season is pretty long so we still have a lot of time to plant. If you have followed the previous month’s calendar then you have saved yourself some time. If you haven’t followed last month’s calendar then add the things from September Calendar to your to do list in addition to things below. 1. PLANT. Planting will take the majority of your gardening time. You are able to plant most of the veggies this month. 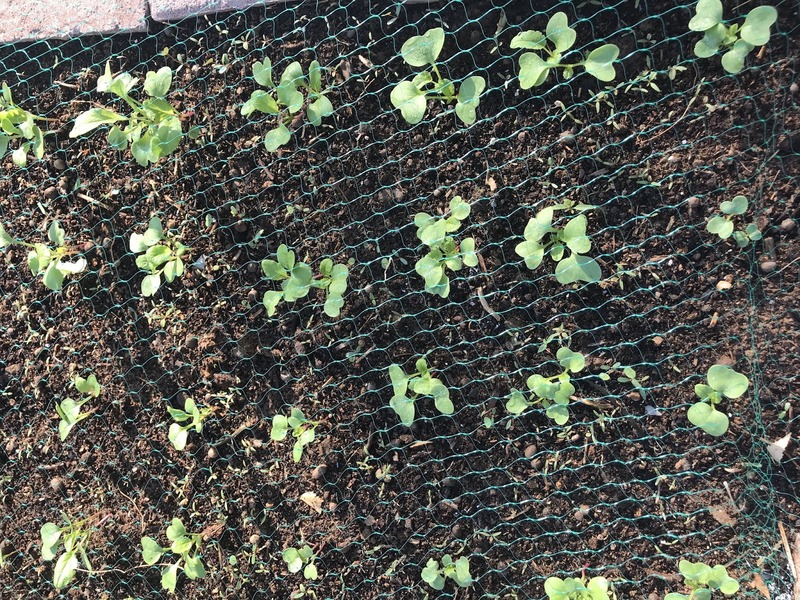 Cold loving and heat sensitive plants, such as spinach and lettuces, should be left for next month though. Heat loving plants can all be planted now. You can start from seeds or buy transplants from nurseries. I’ve seen some already but honestly, it’s still early in the season so you can plant/start your veggies yourself. Either way, the time is good now. I direct seed all root veggies, corn, okra, and some herbs and greens. I start as transplants tomatoes, cabbages and some herbs and greens. I have noticed that for some reason these do well as starts. 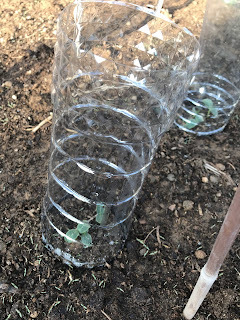 Start planting the plants that have the longest growing times, such as broccoli and cauliflower, so that you can harvest them before it gets too hot in spring. At the same time you must plant veggies sensitive to cold first, such as cucumbers. 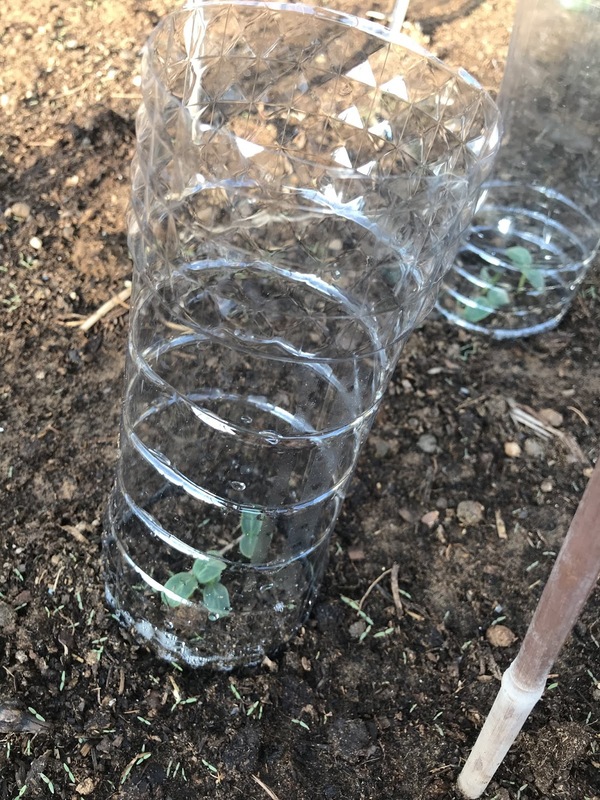 Follow with quick growing plants. I usually dedicate October for edibles and plant ornamentals in November. But it’s totally up to you. 2. PROTECT. The weather is still hot in the afternoon and this can stress the seedlings. Insects start creeping out again so watch for that well. Birds willl start visiting your garden more often as they usually figure out very quickly that you have a garden growing. If given the chance, they will destroy your seedling very quickly. From my observations over the years, I have noticed that birds are attracted to new seedlings mostly and will leave the older, moremature plants alone. So protect your young seedlings from the birds, pests and from the afternoon sun. 3. FERTILIZE. Lots of plants will be putting on new growth now. It is a good time to fertilzie your trees and other perennial plants. The summer heat is gone and some plants will benefit from a fertilizer boost, preferably after the middle of the month. This is sort of generic suggestion as each plant has its own requirement, so please consider each of your plants requirement. 4. PRUNE. Pruning can be done for some plants. The suggestion is generic as for fertilizing, and each plant would have its own requirement. 5. REDUCE WATERING. As the weather is cooling down you don’t need to water your plants as often. I gradually reduce the number of times I water per week. Water less times but deeper. This will not only help you save on water bill. It will help your plants stay healthier and grow bigger roots that will help your plants cope better the coming summer. Today I’d like to briefly talk to you about soil and how do we create the perfect soil mix. This is one of the questions I receive most often. I grew up in Russia, as some of you may know already. We lived in a part of Russia where soil is called “chernozem”. It is a kind of soil with black color and contains high percentage of humus. It is very fertile and is sometimes called black gold. I grew up thinking that all soils around the world are black and when I took up gardening I had no idea that things can be otherwise. You can imagine my surprise when I found out that there are many different types of soils around the world. Turns out not only the color of soils differ but the composition too. I won’t go into details about soil composition and types of soils in this post, will leave it for later.. Soils can be of three major types: sand, clay and silt. Different combination of these make the soils around the world. In this part of the world we have sand. Like pure sand mostly. This is a tricky soil to work with but it has its advantages too. Our soil here has almost nil nutrients, is too alkaline (high pH, will discuss it some time later) in most parts, is often salty which prevents water absorption, dries out too fast and doesn’t hold whatever nutrients we add to it. It’s main advantage is that it’s easy to work with. *you will need to add something for fertility to the above mix. Compost is decomposed organic matter. Compost is a great addition to any kind of soils. It adds a good amount of nutrients, holds on to nutrients, yet provides good drainage. Compost improves soil structure, and is great for any types of soils. Compost is not very readily available here so I use potting soil as well, since it usually is just organic matter of some sorts which compost actually is. 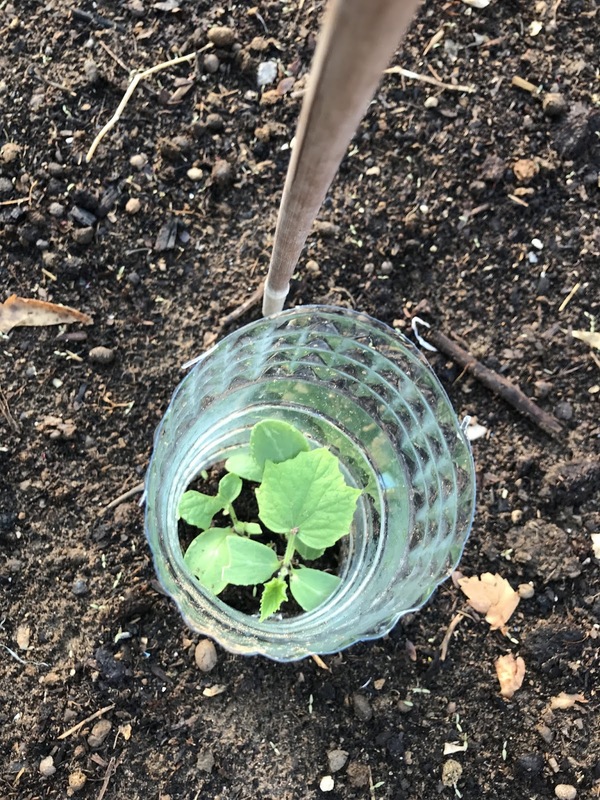 I follow the square foot gardening methods in my garden, so I follow their recommendations and use at least 5 different compost/potting soil sources to create my soil. It is done because most compost brands are a byproduct of some industry, so to create diversity different sources are used. Please read the labels to see the composition.Manures are also considered compost so you can use that too (note, no more than 5 kg per square meter total manures, as this is the recommended use; also if you add manure it’s preferred you wait a couple of weeks before you plant anything). Neither of these carry much nutrients but they’re important to add. Peat’s water absorbing quality helps with water absorption and nutrient retention. Peat moss also helps bring the pH of the soil down a bit, which essential as our soils are alkaline, or on other words have high pH. Most plants prefer pH of aroun 6-7. I prefer to use coco peat because it is more sustainable and renewal source unlike peat moss. But I still add peat moss, but not as much as coco peat. Make sure to mix it well, and it’s eaier if you wet it first. These two are great for creating good drainage, water and nutrient retention. They’re intert and won’t affect soil pH. Vermiculite is more expensive and a little hard to find, but it holds more moisture than perlite. Since there are different grades of both, make sure you get the agricultural grade. 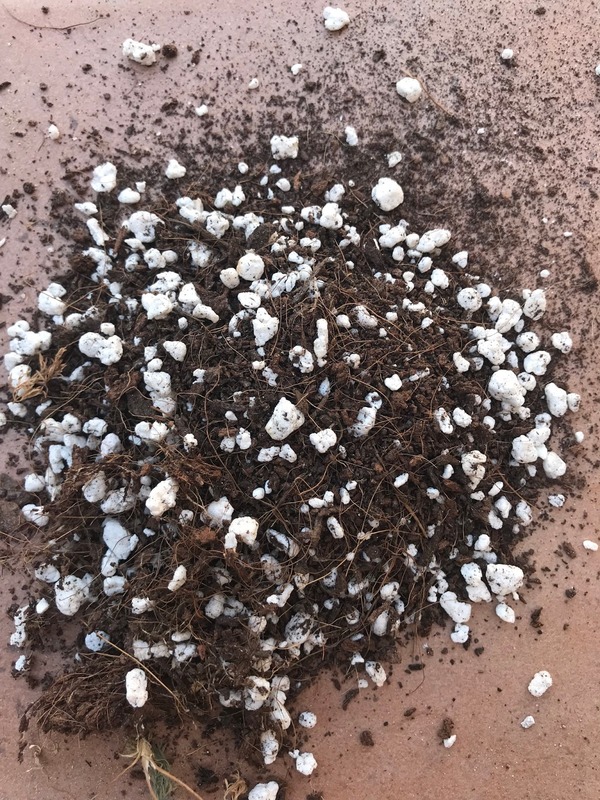 Perlite comes in two grades for garden use: fine and coarse. Use coarse type for pot cuz it’s lighter, and use fine type for gound mix as it’s heavier yet retains more moisture. Wear a mask while working with any of these as they’re dusty. You can add sand to your mixture, or use the sand already present in the soil (if your building garden soil). If you’re making the mix for container plants make sure you use sweet sand from the nursery, as it doesn’t contain salt unlike most garden sand. If you’re mixing the soil into your garden soil make sure you water it well for a few days, especially after summer. The mix above is a basic soil mix suitable for container and the ground. You want to add nutrition in a form of slow release organic fertilizer. It will feed your plants over the season and is a great alternative to hemical fertilizers. If you added manures to your mix you can still add a fertilizer separately, just don’t use as much. I personally use Sustane. I like the fact that’s it’s certified organic, is easy to use and my plants love it. I will talk about fertilizing in more details in another post. I suggest you wear a mask cuz some materials mentioned can be dusty. Like I mentioned earlier I use equal parts of mentioned above materials. I wet coco peat and peat moss before I use it otherwise it’s impossible to mix well. You can leave it to absorb the water. Then measure everything by volume and mix. For small quantities you can mix in a wheelbarrow. I usually use a spare as my measuring tool.. If you’re mixing big quantities add materials onto a thick, heavy duty material, and add in layers then mix. Don’t add all of the materials at once at it can be very difficult to mix well. This is a basic recipe for basic soil mix. 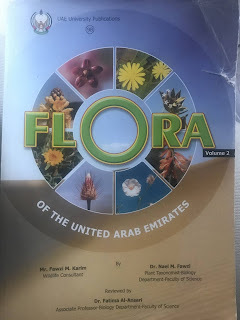 There are other soil amendments and conditioners we can add, and InshaAllah I will talk about them in upcoming posts. 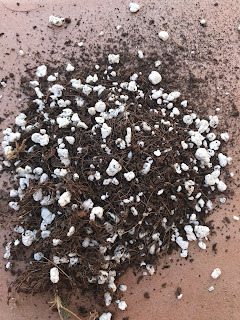 I have covered the basics of soil mix in this post. If you have anymore questions please comment below. I’d like to ask you for a favor. If you like this post consider sharing it with your friends on your social media accounts. Let’s spread some garden love. Hello my fellow gardeners. Old and new, experienced and beginners, and everyone in between. I have missed writing this blog over the summer. I started this blog 4 years ago and I can’t believe it’s actually really been 4 years already. MashaAllah. Time flies. But here I am: still writing, still gardening, still committed and still learning. Alhamdellah. I am thankful to God for all the blessings upon me. I am thankful to still be here. Thankful to have the land to garden. Thankful to be able to spread my knowledge and experience. Thankful to be able to try and experiment and write about it. A lot of things have happened this year. I won’t go into details as this is not my purpose. There were times when my knowledge of gardening and my experience was taken advantage of. There were times when my work was stolen. But I am not here to point fingers. These things don’t bring me down, they only make me stronger. And smarter. I know better now and it was a lesson I hope I have learned well. But I have also met wonderful people, some of whom became friends. I believe there’s more good than bad afteall. I am here to spread my knowledge, to help others whenever and however I can, and to bring people closer to nature. Gardening has many benefits, so many that I in fact plant to write a post about it InshaAllah. I have so many new plans for this blog. With God’s help and hard work, I hope to accomplish these plans and goals that I have in mind. 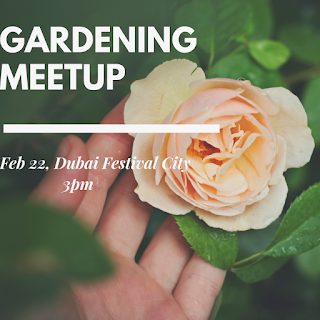 I am planning to introduce a lot of things like the gardening calendar (fist entry is today by the way), DIY’s and How To’s, features of other gardeners’ gardens and many more InshaAllah. I have everything planned out and have written some notes already. If you have ideas you’d like to add please let me know and/or if you’d like me to feature your garden please drop me a line. I am posting this month’s calendar a little late and I apologize for that. Procrastination is a bad habit of mine and I am working on getting rid of it. I really am, trying. I kept saying I’ll write the post tomorrow and didn’t notice that it was a middle of the month already. This is not crucial though, as many of us have just come back from the holidays and it’s still too hot to really garden anyways. I will keep it short and simple despite how excited I really am. This time of the year brings new hope, new dreams and new beginnings into my life. In anticipation of green views, scents and harvests my mind starts working in turbo mode. I make many, many plans and this makes me feel so good, even though I know that not everything I plan for I achieve. I have come to terms with it and just enjoy everything I do as I do it. My gardens are never the same every year, as I try new things, change things, add things. Nonetheless, there are certain things I do in a specific order (more or less) and I will be posting these into the gardening calnedar post every month InshaAllah. 1. Remove old debris from last season, if you haven’t done so already. 2. Clean out your pots, tools and throw away/take to recycling damaged stuff that is beyond repair or use. Tidy up your garden, as it’s easier and more inspiring to work in a clean and organized environment. 3. Make a plan (ideally, it should have been done in summer). Decide what you’d like to grow this season. Include a few things you haven’t tried before. Try Asian Veggies, they grow fast and grow well here, and taste great too. Draw you garden plan. Watch out for our downloadable garden graph paper download soon Inshallah. Will keep you posted if you subscribe to my blog. 5. Buy soil, soil amendments and organic fertilizers that you’d be using (use the link above for where to get your stuff). I only use organic and only suggest organic too, but the choice is yours. 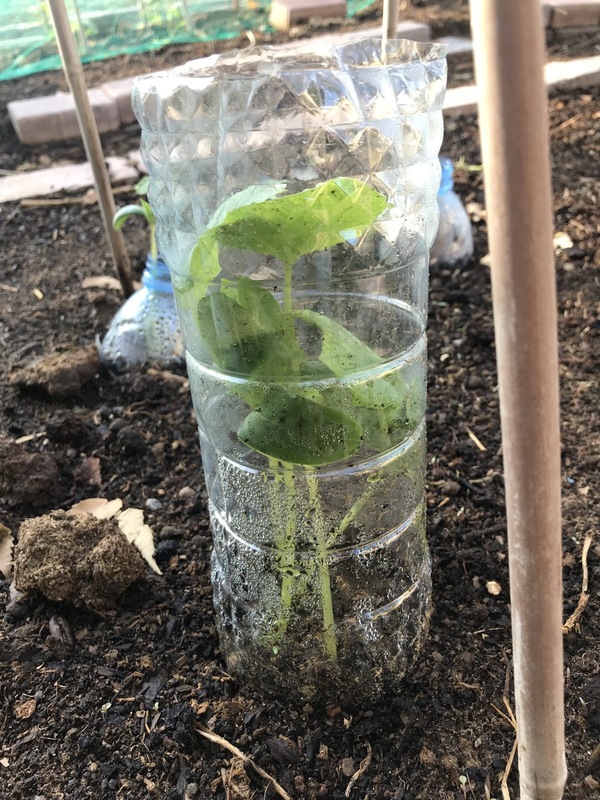 For more details about what gardening amendments I use in my garden and how I was building my soil visit this posts: post 1, post 2, video (I now use equal parts of what I mention in the video). 6. 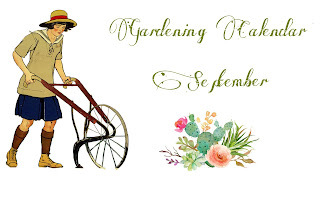 Prepare the soil in your garden beds and containers. To see how I prepare my soil watch the videos on my channel, and read the posts above. If you prepare your soil now, it will have time to settle for your October planting. My Little Garden In Dubai YouTube Channel. 7. Start the seeds of veggies that take time to mature but that still can’t be planted directly in the soil yet. These include things like veggies from cabbage family. 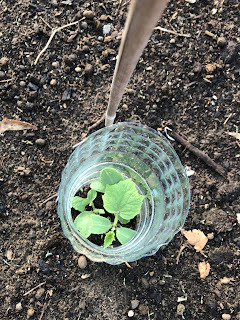 For more info on how to start the seeds in this part of the world, check my post: How to start your seeds (transplants) and succeed. 8. Towards the end of the month, or once it starts cooling down and it’s under 30c degrees for a few nights in a row, plant a few plants directly in the soil. You’d probably want to shade them at first. Heat loving plants could be planted, but watch out for heat spells. I personally don’t plant much as the weather is unpredictable. One that is most suited to plant directly now is cucumber. Other plants you can try: okra, eggplant, mulukhia, kangkong. Some suggest to try peppers but for me they never succeed so I usually start them as transplants or wait till it’s cooler. 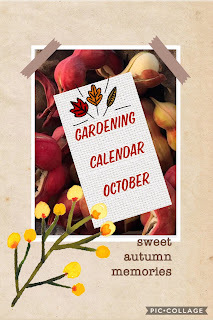 I suggest you check my Useful Downloads Page for planting calendars you can follow (there’s other useful downloads there as well). 9. Check my 12 Steps to a Succeful Garden in Dubai post. It’s one of my most popular posts and it summarizes what you need to do to succeed at edible, and not only, gardening in UAE. Sweet soil or sweet sand??? What you should do in your garden now or "How to prepare your garden for summer"